The season may have only just begun, but it is falling apart for São Paulo already. The psyche of the Brazilian fan is a little different to the average punter in England. In Brazil, Cup competitions matter. A lot. And none more so than the Copa Libertadores. Fans will want their team to perform well in the league, but go on a good cup run, and win a trophy, and even the shoddiest of league form will be overlooked. São Paulo had some big hopes going into this season with the return of fan favourite Hernanes and a Libertadores campaign to get excited about. But things are are unravelling less than a month into the new season: Hernanes isn’t up to speed yet and their Libertadores campaign hangs by a thread. They play Talleres tomorrow night in Copa Libertadores second qualifying round second leg. The match will be played at the Morumbi Stadium in São Paulo. After losing the first leg 2-0 in Argentina, São Paulo have a mountain to climb and will need to win this leg by three goals to advance (or, on penalties, if the match finishes 2-0). I don’t know much about Argentine side Talleres, I must admit. They are not one of the big boys from Buenos Aires, and when I used to live in Argentina and go to games there, they weren’t even in the top division. What I can say with some certainty, is that they won’t be pushovers. It is certainly possible that São Paulo could turn around a 2-0 deficit in front of their own fans. If they can get an early goal, there will be a cracking atmosphere at the stadium. At the time of writing (Tuesday morning in London), more than 32,000 tickets had been sold. I’m expecting a sellout. The problem for São Paulo, and the worry for their fans, is that they have shown no signs of being able to play the sort of football needed to keep a clean sheet and score at least two goals against strong opponents. They limped to a sorry 2-0 defeat in the first leg of the tie, and in the State Championship they have already lost to Guarani, Santos and Ponte Preta. They slumped to a 1-0 loss against Ponte Preta this weekend, despite fielding a strong team. 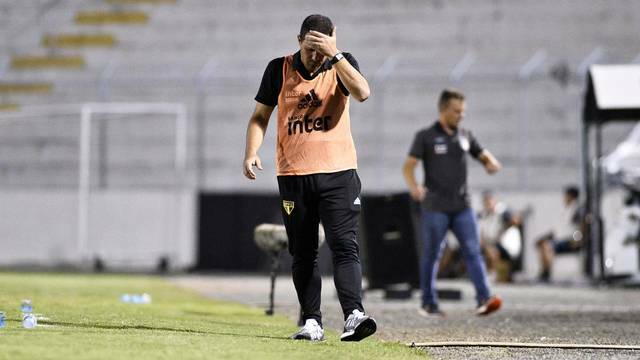 It was a risk by their under fire coach André Jardine to field a strong lineup for that game: the plan seemed to be to see the team play well and get a much-needed, confidence-boosting win ahead of the Libertadores tie. It backfired: not only did it drain some valuable energy from their players, but the result and performance will sap more confidence from them ahead of tomorrow’s key match. It wasn’t meant to be this way: São Paulo are one of the biggest names in Brazilian football and you would expect them to do better. After a couple of disappointing seasons, things seemed to be back on track last season, under the Uruguayan coach Diego Aguirre, and with a new organisational structure and senior club management team in place. But after being in with a shot of winning the league title, and indeed leading the Championship at the halfway stage (they hadn’t qualified for the Libertadores last year), they lost their way. The team’s form dipped and they reacted by firing the manager – the same one that had turned the club around from mid table mediocrity, into title contenders. Their form didn’t get much better and they slipped from title contenders, and outside of the Libertadores automatic qualifying spots. That decision, and the constant turnover in managers, seems to be costing the club now. André Jardine looks to be short of ideas, and is struggling to get a reaction from his players. He faces a huge task to guide São Paulo into the Libertadores third qualifying round tomorrow. And even if he does, I’m afraid that it might not be long before the 2019 edition of the revolving door of managers at Brazilian clubs starts spinning. This entry was posted in Libertadores, State Championships and tagged André Jardine, São Paulo by Brian Davidson. Bookmark the permalink.